What Are the Benefits of Wide Pushups? When you are designing a fitness facility, equipment placement is essential, not just for customer ease and aesthetics, but also for safety. You need a facility that is inviting and functional and provides a wide variety of equipment for diverse clientele. The facility may include cardio equipment, circuit machines, free weights, plate-loaded machines, squat racks and lifting platforms. Circuit machines include weight stack machines manufactured by Nautilus and Cybex, for example. Have a separate area for circuit machines, away from free weight or plate-loaded machines. Arrange machines in an order such that they work opposing muscle groups, such as a back machine followed by a chest machine, or a biceps machine followed by a triceps machine. This allows people to move with ease through a total body workout with minimal rest between exercises. Place each machine a minimum of 24 to 36 inches apart. Set aside a special area for all lifting platforms, squat racks and Smith machines. According to the National Strength and Conditioning Association, you should leave enough room near each platform to accommodate three to four people, although only one person should be lifting at a time. Allow a walkway three to four feet wide around each platform. Place benches with attached barbells so the ends of the barbells are at least 36 inches from each other. This allows room for spotters and for patrons to pass by. Leave 36 inches of clearance around all weight trees and racks. Traditionally, long dumbbell racks are placed in front of mirrors to allow patrons to monitor their form. If your facility has plate-loaded machines, such as Hammer Strength equipment, group them together away from dumbbells and free weights. Provide weight trees near plate-loaded equipment. Place tall equipment such as assisted pullup and lat pulldown machines near the perimeter of the space. All tall equipment should be bolted to the floor. Attach mirrors a minimum of 20 inches above the floor to avoid potential damage by rolling plates and other equipment. Have drinking fountains available near entrances and exits to accommodate traffic flow. Group all cardiovascular equipment together. Bike and stair machines require a 24-square-foot area. 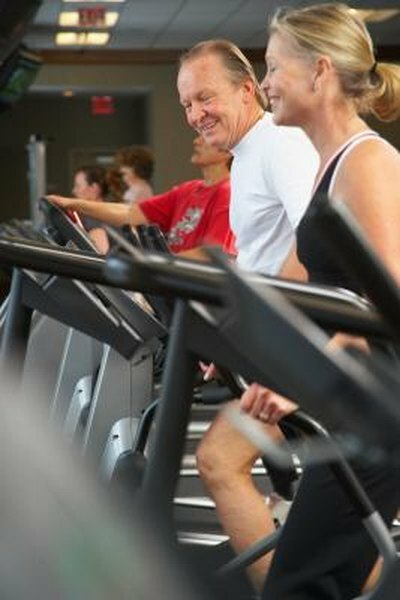 Treadmills require 45 square feet. The American Disabilities Association has specific universal requirements regarding fitness center setup; but each state may have additional guidelines, so research your own state's requirements. If there is a change in elevation over half an inch, you need a 12-inch ramp or slope. To accommodate wheelchairs, doors and entryways must be a minimum of 36 inches wide. All light switches, AEDs and drinking fountains must be low enough to be accessible by patrons in wheelchairs. Signage must be clear and visible to people with impaired eyesight.